When I first picked up this book, I was struck by how short it is. I estimated 40,000 words; that would make it a novella under some of the varying definitions of the word. The Wikipedia entry for the term "novella" also notes that: "For the German writer, a novella is a fictional narrative of indeterminate length––a few pages to hundreds––restricted to a single, suspenseful event, situation, or conflict leading to an unexpected turning point (Wendepunkt), provoking a logical but surprising end." That definition fits this story perfectly. The book begins with a dry description of the contemporary killing of 85-year-old Hans Meyer in the Brandenburg Suite at Berlin's famed Adlon Hotel. It's no mystery who killed Meyer. Fabrizio Collini, a recently retired worker at Daimler AG's Mercedes-Benz factory in Stuttgart, turns himself in immediately. Caspar Leinen, a newly-qualified lawyer, is appointed to represent Collini in his murder trial. Only after his appointment does Leinen learn that the murder victim is his first love's grandfather, a man with whom Leinen himself spent many happy hours in his boyhood. Complicating matters further, Collini politely, but determinedly, declines to tell Leinen why he killed Meyer. Whatever his professional ethical obligations are, Leinen feels morally compelled to do everything he can to find out why Collini killed Meyer. The results of Leinen's investigation play out in the course of the dramatic trial, and not only provide one heck of a Wendepunkt, but also raise complex questions about the nature of justice. There is nothing sensationalistic about the treatment of the trial's turning point. The description of the trial is engrossing, and notable for the many differences in German criminal procedure from US procedure. The tone of the book is deliberate and detached; the language direct and unadorned. Somehow, though, that gives it an almost searing effect, and I found myself still thinking about the book several weeks after reading it. Anyone who enjoys legal thrillers should find this an unusual, but satisfying and thought-provoking read. 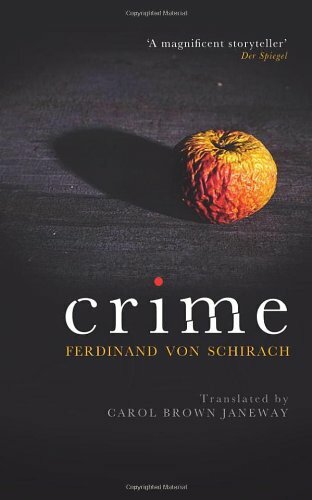 Ferdinand von Schirach isn't a name well-known in the US, but he has two previous well-received collections of crime short stories, titled Crime and Guilt. The Collini Case, his first novel, was a sensation in Germany when it was published there in 2011. That last name, von Schirach, might have caught your eye if you're a student of World War II history. Ferdinand is the grandson of Baldur von Schirach, the head of the Hitler Youth organization, who was convicted at Nuremberg of crimes against humanity and served 20 years in Spandau Prison. 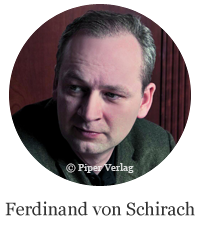 Ferdinand is a prominent criminal lawyer in Germany. I can't say more without spoiling the book, but Ferdinand has been open about how his family's past affected his writing of this book. If you would like to read a moving essay by Ferdinand about his Vergangenheitsbewältigung (one of those wonderful German portmanteau words, meaning the process of coming to terms with the past), you can find it here (Part 1) and here (Part 2). However, it would be best that you not read this essay before reading The Collini Case. The Collini Case will be published in the US on August 1, by Viking. Note: The publisher provided me with an advance review copy of The Collini Case. Sorry I missed your comment until today. This was a real change-of-pace read. I hope you like it.